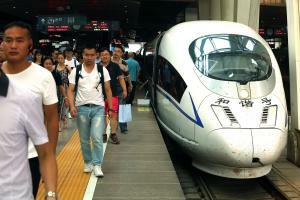 March 7 (UPI) — China has begun testing a new bullet train route that will connect Beijing, the capital, to the northeastern city of Shenyang, not far from the country’s border with North Korea. China’s high-speed rail corporation is conducting full-scale tests of the rail line that will allow travelers to move between the two major cities in two hours and 30 minutes, state-owned People’s Daily Online reported Wednesday. The new “Jingshen” line connecting Beijing to Shenyang includes a recently completed segment that runs through Liaoning province, where the city of Dandong is located, across the Yalu River from the North Korean city of Sinuiju. The Liaoning segment is undergoing tests, and a segment that lies near Beijing and Hebei province will be tested before the end of 2018. The line could be in full operation in 2019, state media says, and the route will shorten travel time for a trip that at present takes four to five hours, according to the report. The long-term plan is for the high-speed rail to connect to China’s Inner Mongolia region in the west and “greatly enhance passenger capacity between the northeastern region and the metropolitan areas,” state media said. Work on the Jingshen line began in the spring of 2014, and construction on the Beijing segment started in December 2015. China has been less actively pursuing economic opportunities in its northeast, but in February promoted a free trade zone, Hushi, at an international expo in the city of Dandong, South Korean newspaper JoongAng Ilbo reported. The zone will be located between the Chinese city of Hunchun, in the Yanbian Korean Autonomous Prefecture, and Kyongwon County in North Korea, according to Hunchun city authorities. Investment will come from a Hong Kong firm and North Korea businesses have been banned from investing owing to sanctions, according to the report.